Ant or Maven project is opened in Visual Studio. You can find instructions how to create an Ant project in this section, or Maven in this section. Sometimes you might want to add some files to the project not being Java sources or resources visible to underlying project system (Ant or Maven). IntegraStudio offers the Additional files node in the project for that purpose. Information about files and directories added to this node is stored on the IntegraStudio level in isproj file, outside Ant or Maven scope. The New item option opens another wizard allowing to choose item kind. 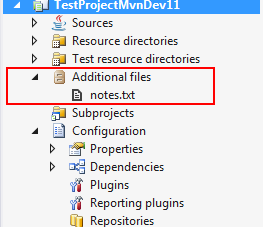 Currently, two are supported: Empty text file and Virtual folder. The first one is self-descriptive, you can create an arbitrarily named file and add it to the project. The Virtual folder creates a folder similar to regular Visual Studio folders, not corresponding to any particular folder on the disk. The Existing item option allows to choose existing file path on the disk. It adds a reference to specified file. The New folder option allows to choose directory path on the disk. It adds a reference to specified directory. All files and subdirectories inside that directory will also be visible (recursively). The selector dialog also allows to create new folder on the disk. 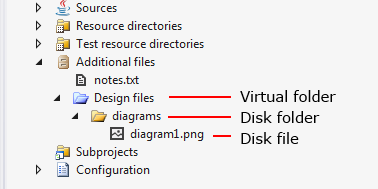 Virtual folders can also contain elements listed above (including inner virtual folders). Each of the elements can also be removed or renamed.